A camel is a very strange but at the same time very useful animal for a human being. 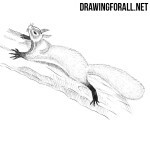 This animal, adapted to life in the arid regions of the world – deserts, semi-deserts and steppes, was saving for people living in those regions. 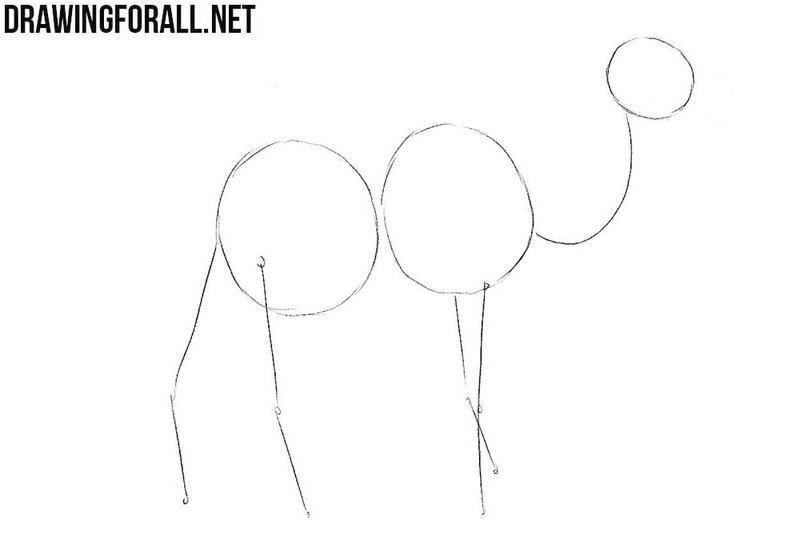 As you already guessed, in this lesson we will show you how to draw a camel. 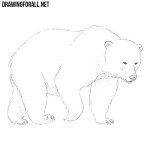 The first steps of this lesson are quite similar to the first steps of lessons about other ungulates (for example, about a giraffe or a muskox). 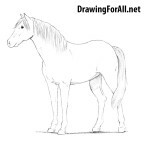 We sketch out a round head, a long curved neck and two large circles for the chest and pelvis. Next sketch out the legs and go to step number two. 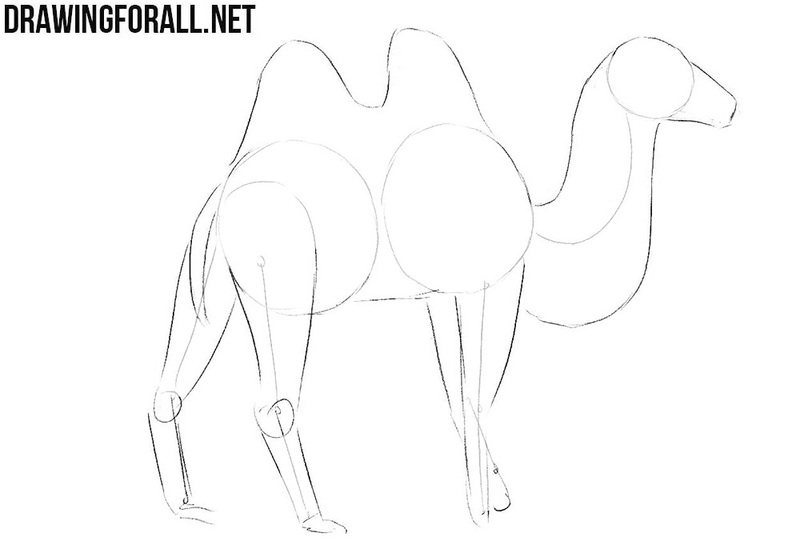 Starting with this step, we will add the volume to the body of the camel. First of all, we sketch out the muzzle. 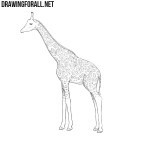 Draw the outline of a long and fairly thick neck. Add the volume to the front legs and go to step number three. Let’s add the volume of the rest of the camel’s body. 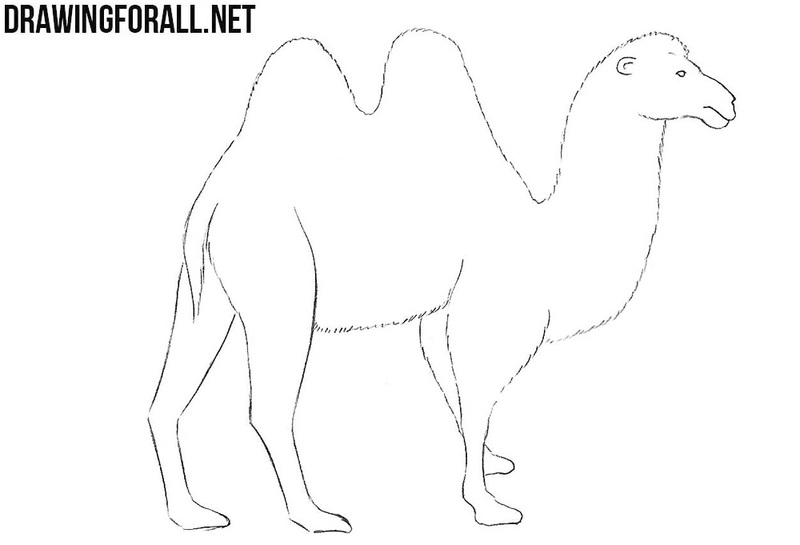 Draw two fairly high humps (as you have noticed, we draw a two-humped camel, which is quite different from the one-humped one). 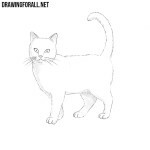 Next, draw the belly line, add the volume to the hind legs and draw the tail. The general outlines of the figure of the camel are ready and now we will take care of the details. Carefully draw out the muzzle of the camel, forming the mouth, nose and eye. 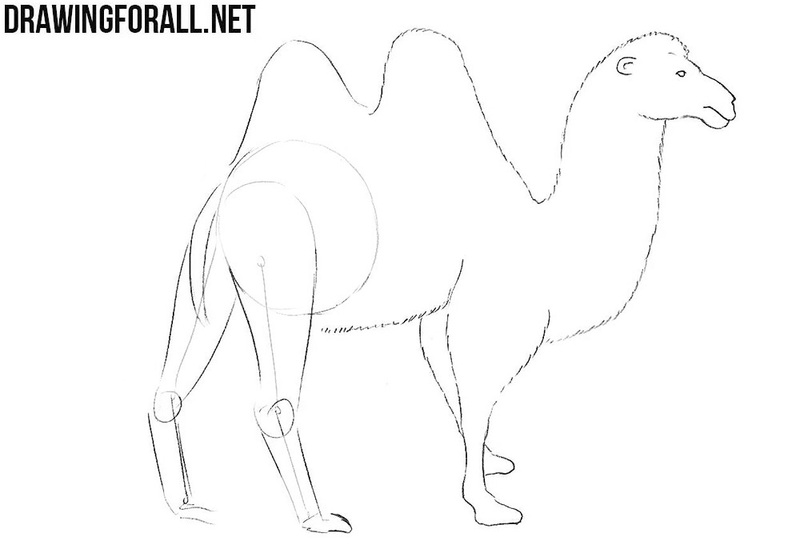 Next we draw the ear and the wavy outlines of the neck of our camel. Continuing the wavy lines of the neck, carefully draw out two humps in the upper part and draw the legs in the lower part. 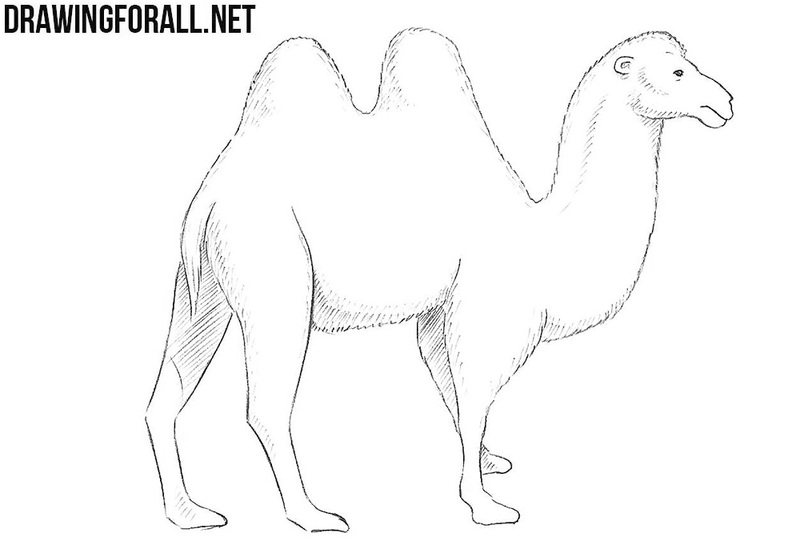 Do not forget to remove unnecessary lines from the front of the camel. 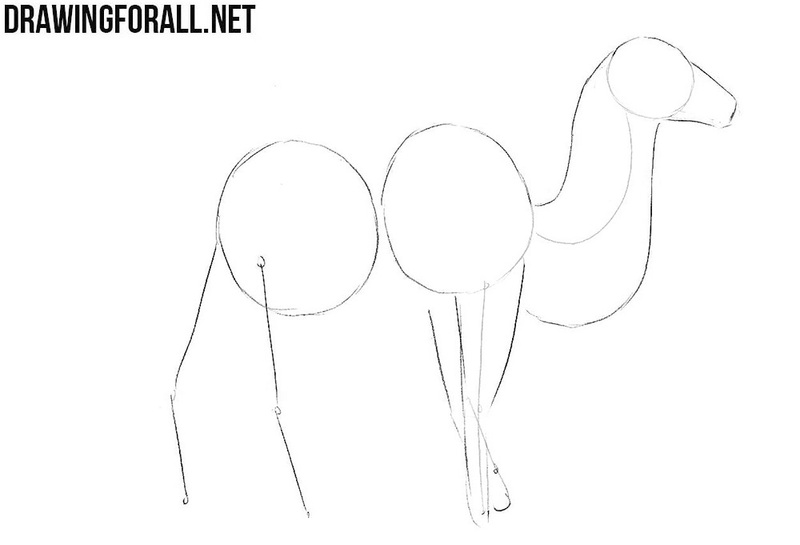 We finish the figure of the camel neatly drawing the hind legs and the short hairy tail. Delete all remaining guidelines and add the necessary corrections before the last step (if necessary). 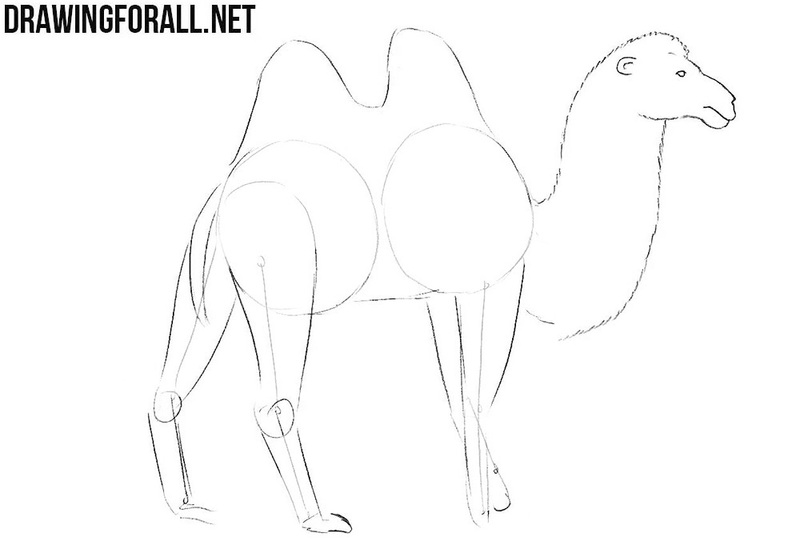 Here is the last step of the lesson about how to draw a camel, where by tradition we will add shadows. Add shadows by hatching, taking into account the angle of light falling and the places where the shadows fall. 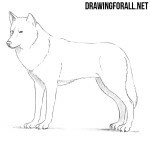 Using short strokes, add the texture of the fur as in our example. Our task is to teach you how to draw complicated things in a very simple way. And it is equally important that the result be realistic enough. If we cope with our task – let us know about it. If not, then let us know about it too. And also be sure to subscribe to our social networks – this will greatly help us to evolve and make new cool tutorials.